Britain’s only specialist nettle beer brewery may be forced to close because of EU rules which state the ancient bitter is not actually an ale. The ruling means the Cornish family who brew the traditional beer using a centuries-old recipe face a bill of almost £10,000 in backdated duty, because the drink now falls into a higher tax band. The couple have also had their entire stock of 2,280 bottles impounded by Customs officials. 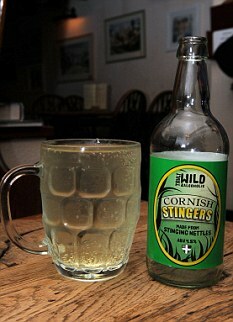 The brew, named Cornish Stingers, is served on tap or in 500ml beer bottles, produces a white frothy head when poured and has a 4.5 per cent alcoholic content, similar to most ales. But Brussels bureaucrats say it does not qualify as a beer for tax purposes because it does not contain malt. Nor do they class Cornish Stingers a ‘grape-wine’, spirit or cider – but instead categorise it as ‘made-wine’ alongside alcopops such as WKD and Smirnoff Ice.